We are used to watching buildings grow as they are built but sometimes buildings shrink.Watch this strange video of a skyscraper seemingly shrinking before your eyes. In Japan this Tokyo skyscraper shrank in size from 460 feet tall down to nothing. in just a few months. 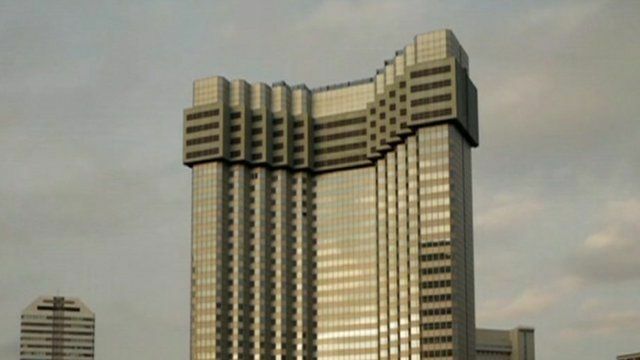 The seemingly magic trick on the Grand Prince Hotel Akasaka was performed by the Taisei Corp., a construction company, or should that be deconstruction company, that has come up with a new form of demolition. Traditionally when buildings are set for demolition they are blown up with explosives and they disintegrate in a couple of seconds but in densely populated, built-up areas demolitions create serious dust and noise problems. So the Taisei Corporation decided to dispense with dynamite and came up with a different solution – slowly take down the skyscraper one floor at a time. Workers are beased on the top floors and then use cranes inside the building to remove the floors below. Temporary columns are inserted which are slowly lowered by jacks. “We thought, is it really possible to safely disassemble buildings over 100 meters? We thought we needed to research that, which is how Tecorep’s development started,” says Hideki Ichihara, who oversees costruction technology development Taisei Corp. It took the company 18 months to come up with this novel solution to a growing problem – how to take down skyscrapers safely, quietly and without polluting the environment. came up with Tecorep in about a year and a half. Taisei’s Ecological Reproduction System or Tecorep as it is known, is an environmentally positive solution –reducing dust emissions by 90% and noise by 25%. And by taking down the building piece by piece they can recycle many more of the materials.In addition, the internal cranes generate surplus power. In the same way that hybrid cars generate energy when they brake, cranes can generate energy when they lower things. This surplus energy is used to power the site’s lighst and construction equipment. With such positive benefits its predicted that more and more city skyscrapers will be demolished this way – floor by floor.